How Do You Make the Best Roasted Cauliflower? Up until a few years ago I would have told you ‘the best’ cauliflower was an oxymoron. In general, I’ve never been a fan of cruciferous vegetables, having grown up being served bowls of boiled mush on the regular. It’s one of those childhood food memories that has stuck with me until my adult years. When the kids were small, I made a point of serving them broccoli, cauliflower, and cabbage even though I didn’t like them. Hopefully by keeping them crisp and covered in cheese I didn’t scar them for life. I wish I had known about roasting vegetables back then because it really brings out some amazing flavours. I haven’t tried roasted broccoli yet, but now that I’ve roasted cauliflower, I am hooked! Everyone has their own taste preferences but I prefer my whole roasted cauliflower to be a deep golden colour on the outside. The inside should be slightly al dente (no mushy cauliflower!) but still easily sliced with a knife. What Do You Eat Cauliflower With? 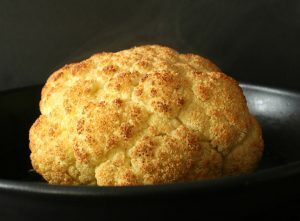 For a great roasted cauliflower, simply use olive oil, salt, and pepper and allow the simple flavour to shine through. 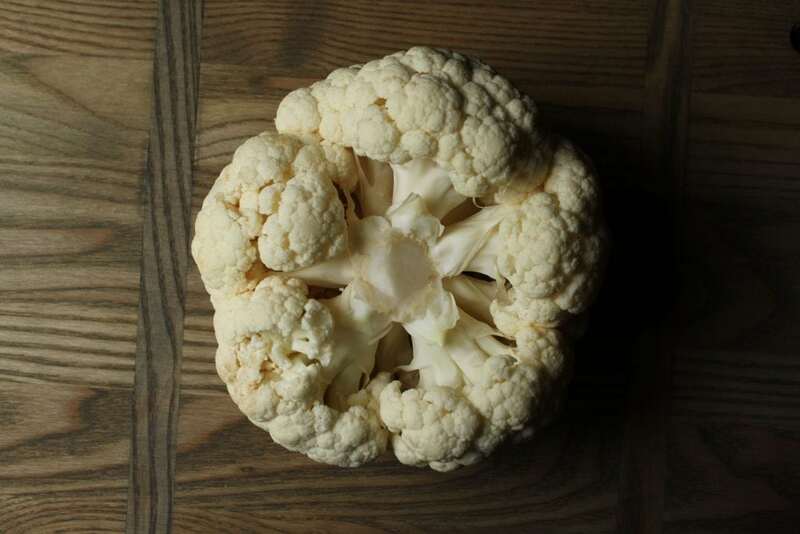 Cauliflower has a very neutral flavour which means that it pairs well with flavourful sauces. Pair it with a delicious Romesco sauce and some Beluga lentils for an impressive vegan main dish. Cheese lovers rejoice because cauliflower is the perfect vehicle for a decadent cheese sauce. You can also just sprinkle grated Parmesan during the last 10 minutes of roasting. Lightly steamed cauliflower florets, fry up some breadcrumbs in butter, season, and add to the cauliflower. 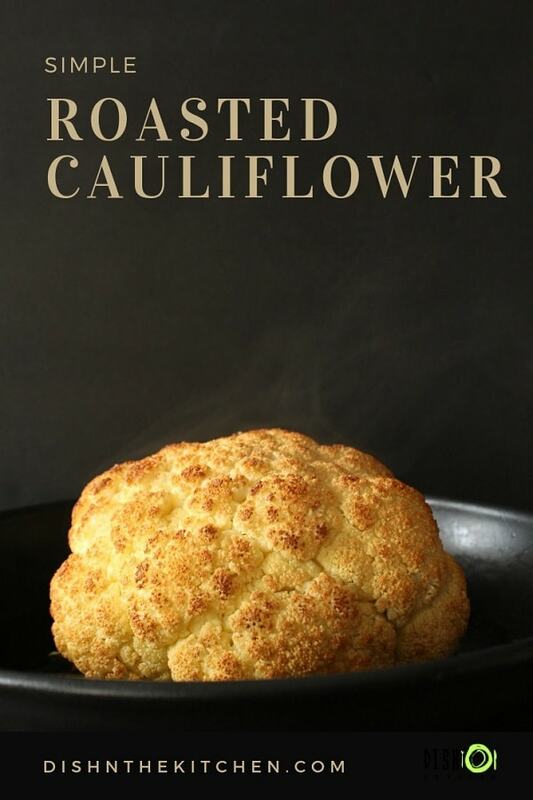 It would have be so easy to just give up on cauliflower and focus on other more delicious vegetables. The truth is, I’ve had some GREAT cauliflower dishes while dining out so I know it can be done. When I found heads of cauliflower on sale for one dollar, I just couldn’t resist buying a few for ‘research purposes’. Cauliflower is more than just a vehicle for cheese. It’s high in fibre which helps digestion and in weight loss (sans cheese). 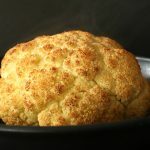 You may be surprised to learn that cauliflower is also high in vitamin B and just one 100 g serving will give you 80% of your daily dietary vitamin C. Cauliflower and other cruciferous vegetables are also high in Vitamin K, which is important in increasing blood clotting proteins and assisting in bone metabolism. A Perfectly Whole Roasted Cauliflower is a wonderful thing and it's easier than you think. Cover a baking sheet with aluminium foil. With a small paring knife, carefully remove the bottom part of the core without detaching any florets. 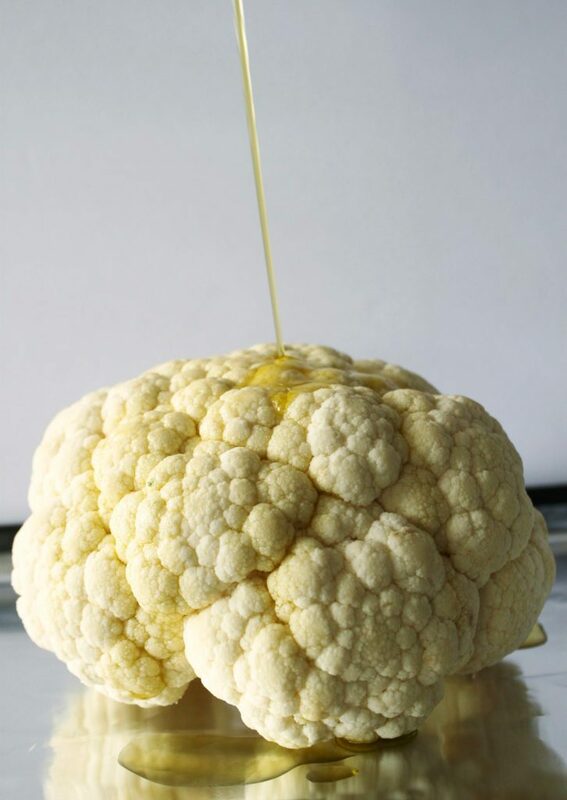 Place the cauliflower core side down on the baking sheet and pour a few tablespoons of olive oil over it. Rub the oil in until you are satisfied the entire head is coated. Roast for 50 minutes. I like my stems to be a little al dente but if you want them a little more cooked and the cauliflower is quite brown you can cover it with foil and roast for another 10-15 minutes. Beautiful photo, Bernice! And a terrific recipe too–so simple and soooo delicious! Thank you Elaine!! Sometimes simple is the best. Fun Fact! 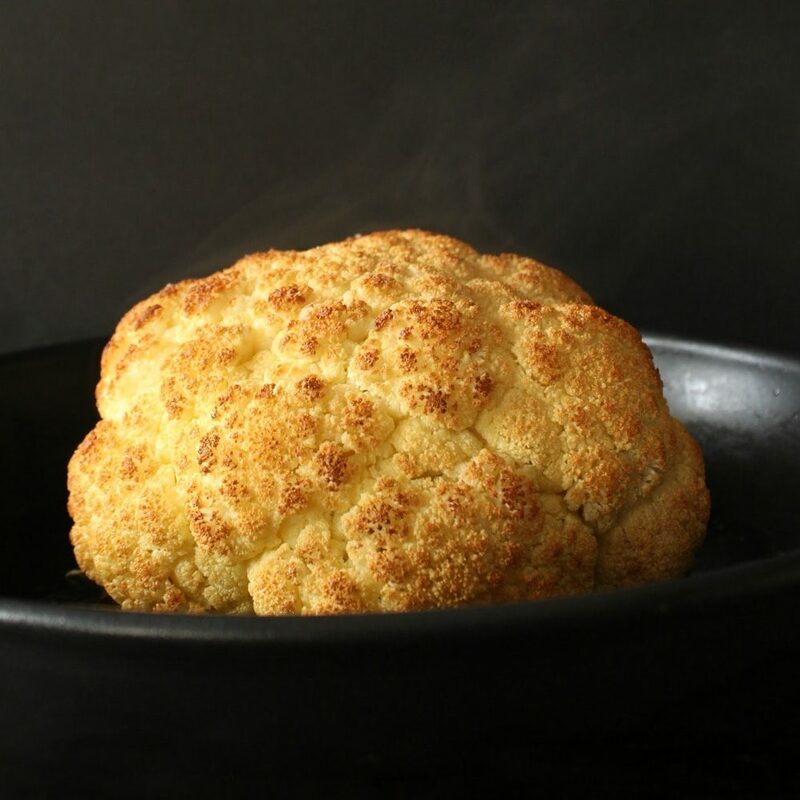 Cauliflower was the first vegetable I enjoyed eating as a child…so much so that for dinner some nights, I wanted a steamed cauliflower with a little bit of ketchup on the side! 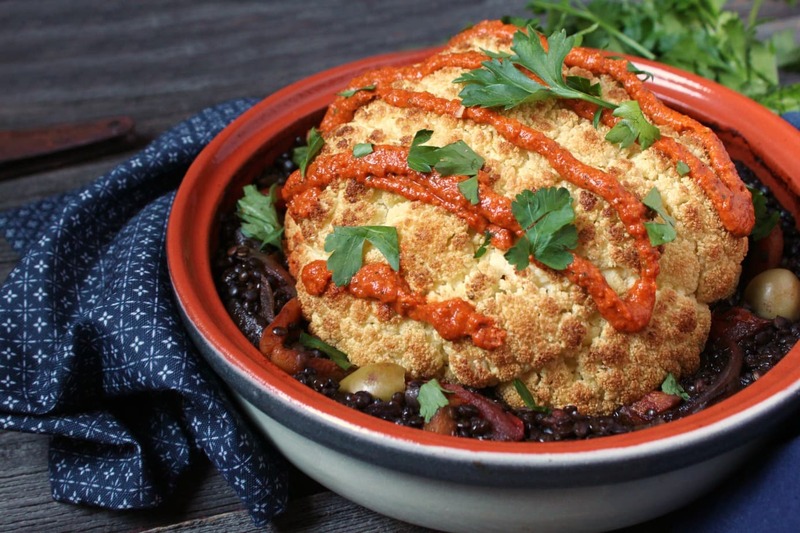 In hindsight, I really wish I had access to a delicious cauliflower recipe like this one!!! Cauliflower and ketchup hey? That’s quite the combo!! Thanks for sharing you’re childhood food memory with me Riz! I also used to cover cooked cauliflower in cheese for my kids! More recently, I’ve often roasted it, cut into florets and covered with lots of spices. I must try this simple version so that I can appreciate the vegetable itself. Well, there’s nothing wrong with cheese but sometimes simple speaks for itself.